DC Home and Condo Prices: How not to sell a million dollar house? I'm actually amazed at the poor quality of the majority of web listings. The internet allows one to show so many detailed photos (versus a flyer for example), yet not many people are really taking advantage of this. I actually don't mind when I see this stuff. I call it Competitive Advantage. I think it's strange that the web listings continue to use the abbreviations that were used for newspaper listings. Do you get charged by the word for an internet listing in the same way that newspapers used to charge? If not, then it would be much better to write the listings in understandable English. The use of spell-check would also seem to be in order. The pictures appeared to appeal to someone. The house is under contract. Good news for the seller. 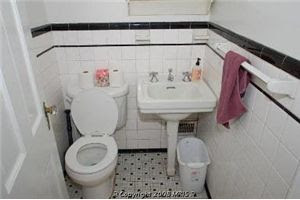 The thrust of my comment was that a real estate agent - or a hired hand - didn't bother to portray the listing in its best light, which isn't what I call good customer service. At least put the toilet seat down. The people that bought this house were obviously idiots.